I had a store bought Kite I was going to Mod. I could never get it to fly. So I made this Sled Kite. Just need some wind now. plastic sheet, party table covers. They are 4 ft x 4 ft. The garden canes are 2ft. The anchor points are duct tape. The Sheet is 4ft wide so measure in 1 ft from each side. Attach the canes with a tab of duct tape, top and bottom. I joined 2 canes together with heavy copper wire to give me the length i needed. I folded the edges together and trimmed the sides, adding bridle anchor points. I used fine but strong nylon twine across the anchor points. The Panda face was drawn on with a marker pen. Now all I need is some wind for out door shots. The next kite up will be a delta wing. It looks like the upper side edges of the rectangle shapet kite hafe got the same length like the lower ones. 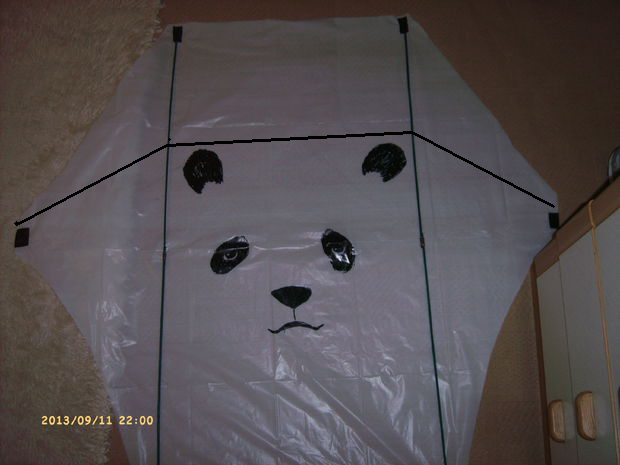 But at this kite-typ, called sled kite, the upper edges must be shorter than the lower ones. Great job. Flies great, right?